Want to Buy your 49 Inch LG 49UJ670V Smart 4K Ultra HD HDR LED TV later? The slim design of the LG 43UJ670V Smart TV, paired with the latest Ultra HD innovation and HDR picture technology, means that it looks good from every angle. HDR gives you incredibly clear blacks and natural contrast, for a true-to-life picture. With 4K upscaling youll get the best experience from all your content. To match the stunning picture quality, youll also enjoy multi-channel ultra-surround sound. For entertainment, look no further than the built in, award winning Smart TV webOS. Connect quickly to Netflix 4K HDR content or catch-up on TV with Freeview Play. Easily plug in any extras with 4 HDMI and 2 USB ports. Model number: 49uj670v. Television picture quality: LED TV Screen. 4K Ultra HD display resolution. Hz. Viewing angle 178/178 degrees. Resolution 3840 x 2160 pixels. Dimensions: Screen size: 43 inches. Size of TV H64.5, W110.7, D7.9cm. Size of TV with stand: H70.5, W110.7, D25.9cm. Weight of TV 11.3kg (unpackaged). Weight of TV with stand: 12.7kg. Footprint of TV 829cm. Suitable for wall mounting 300 x 300 bracket. Length of cable: 1.5m. Packaged size H80.5, W119.3, D17cm. Packaged weight 15.5kg. Sound quality: 20 watt RMS power output. Connectivity: 2 USB ports and 4 HDMI sockets. Component video socket. Composite socket. Optical connection. Built in Wi-Fi. Ethernet connection. Bluetooth. DLNA compatibility. Smartphone remote. Smart TV features: Smart TV. Web OS operating system. Compatible with the following smart apps: Netflix, bBC iPlayer, iTV, demand 5, 4od, Amazon Prime, youTube. Internet browser. Miracast. Digital features: Features USB video playback. Micro dimming technology improves the contrast by dimming individual sections of the TV screen. HDR. Freeview Play digital tuner. Freeview Play (UK) and Saorview (ROI). Saorview digital tuner (Saorview can only be received in the Republic of Ireland). Quad core processor. Additional features: Sleep timer. Parental controls. Energy efficiency information: Energy efficiency rating: a. Energy efficiency index (EEI) 0.26. On mode power consumption 85 watts. Annual power consumption 118kWh. Standby power consumption 0.3 watt. This product contains lead. How to buy Brand New 49 Inch LG 49UJ670V Smart 4K Ultra HD HDR LED TV through Phone Retailers? Phone Retailers compare prices of 49 Inch LG 49UJ670V Smart 4K Ultra HD HDR LED TV with hundreds of retailers. You simply need to select the best price of 49 Inch LG 49UJ670V Smart 4K Ultra HD HDR LED TV from one of the retailers. Once you have found the cheapest price for 49 Inch LG 49UJ670V Smart 4K Ultra HD HDR LED TV, proceed on to the seller's website to complete checkout process and make payment online for 49 Inch LG 49UJ670V Smart 4K Ultra HD HDR LED TV. Complete the checkout process for 49 Inch LG 49UJ670V Smart 4K Ultra HD HDR LED TV and wait for delivery of your order. Make sure someone is available to sign for your delivery. How to find out the best deals for 49 Inch LG 49UJ670V Smart 4K Ultra HD HDR LED TV? We list the retailers based on their price offer for 49 Inch LG 49UJ670V Smart 4K Ultra HD HDR LED TV, reviews, ratings, delivery time and method. You can select the retailer suited to your preferences. Can I compare 49 Inch LG 49UJ670V Smart 4K Ultra HD HDR LED TV prices online? What is the cheapest offer on 49 Inch LG 49UJ670V Smart 4K Ultra HD HDR LED TV? 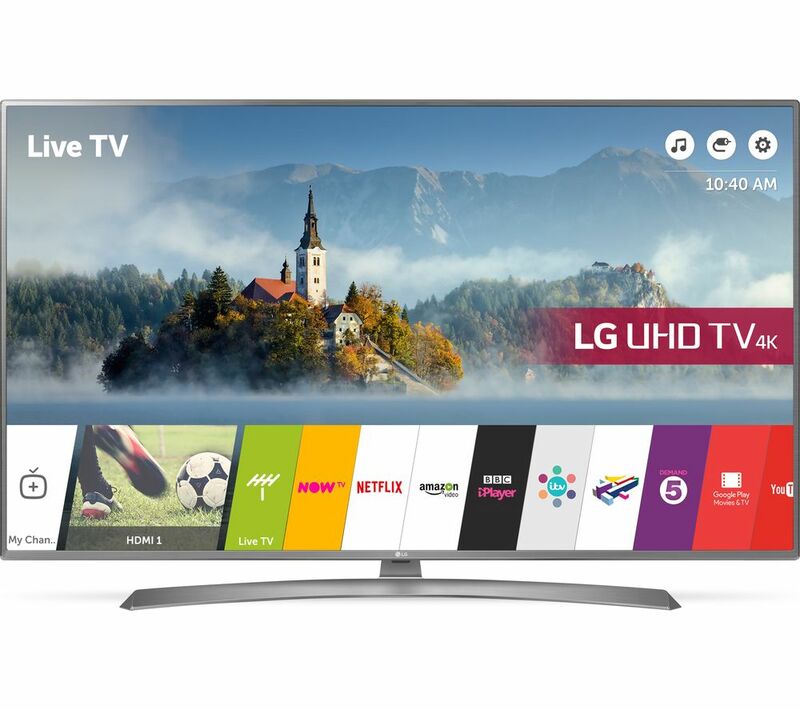 Cheapest Price of 49 Inch LG 49UJ670V Smart 4K Ultra HD HDR LED TV today is £419.00 offered by Argos whereas the highest offer is £419.00 by Argos. You can save approximately £0.00 when you buy Brand New 49 Inch LG 49UJ670V Smart 4K Ultra HD HDR LED TV. Can I buy 49 Inch LG 49UJ670V Smart 4K Ultra HD HDR LED TV and pay online? How long will it take to get my 49 Inch LG 49UJ670V Smart 4K Ultra HD HDR LED TV delivered? Shipping methods and delivery time is different with each merchant. You can check on 49 Inch LG 49UJ670V Smart 4K Ultra HD HDR LED TV listing next to the retailer, their dispatch time and payment methods. Is it safe to buy 49 Inch LG 49UJ670V Smart 4K Ultra HD HDR LED TV online? We can assure that it is totally safe & secure to purchase 49 Inch LG 49UJ670V Smart 4K Ultra HD HDR LED TV online with Phone Retailers. The retailers affiliated with us are verified and trustworthy. How to get the best price for 49 Inch LG 49UJ670V Smart 4K Ultra HD HDR LED TV and choose the best retailer selling it Online? I want to buy a brand new 49 Inch LG 49UJ670V Smart 4K Ultra HD HDR LED TV. How much can I buy it in Brand New condition for? Argos and 0 other retail is selling 49 Inch LG 49UJ670V Smart 4K Ultra HD HDR LED TV for as low as £419.00 in brand new condition. You can also check the price for refurbished 49 Inch LG 49UJ670V Smart 4K Ultra HD HDR LED TV. How many 49 Inch LG 49UJ670V Smart 4K Ultra HD HDR LED TV can I buy in brand new condition online? You can check on retailers website to see how many brand new 49 Inch LG 49UJ670V Smart 4K Ultra HD HDR LED TV they have in stock and order 49 Inch LG 49UJ670V Smart 4K Ultra HD HDR LED TV directly on their website. How easy is it to buy a brand new 49 Inch LG 49UJ670V Smart 4K Ultra HD HDR LED TV through Phone Retailers? It’s a very simple process, we compare you the best prices for a brand new 49 Inch LG 49UJ670V Smart 4K Ultra HD HDR LED TV so that you can check how much does it cost online. Once you choose the most suitable retailer, all you need to do is add 49 Inch LG 49UJ670V Smart 4K Ultra HD HDR LED TV to the basket and complete their checkout process to place an order. What stores are selling 49 Inch LG 49UJ670V Smart 4K Ultra HD HDR LED TV in brand new condition? Retailers like Argos, offers best retail prices online for 49 Inch LG 49UJ670V Smart 4K Ultra HD HDR LED TV. You can buy it for as low as £419.00 online in brand new condition.